The Present Group Issue #21 is here! Christine Wong Yap. 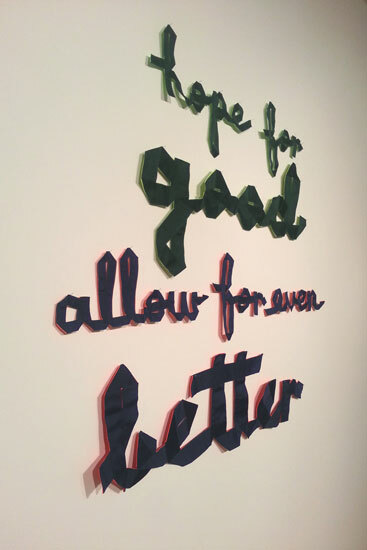 Ten Banners for Home and Office, 2012, three-color screen print on cut holographic vinyl, edition of 50, 13.5×19 inches. The Present Group Issue #21 is now available! It’s a new poster / sticker sheet. Each of the ten banners can be removed and adhered to various surfaces, such as walls, mugs, or dashboards. You can also write on the banners, creating memos of things to celebrate. I created the design especially for The Present Group, an Oakland, CA subscription art service. I styled and photographed an array of ribbons, and shot numerous exposures for the cyan shadings. It was printed by Forthrite Printing in Oakland, CA in a limited edition of 50. Since the poster is holographic, it reflects in rainbow colors. You can see some of this effect via an animated GIF at The Present Group site. You can also see the poster in person in Kearny Street Workshop’s exhibition, Nomad, which opens this Friday, September 28. I’ll also show another screenprint project as well. The Present Group is a subscription art service, but individual orders are available. For how much? You might be pleasantly surprised. Give Thanks (installation detail at Untitled Gallery / Project Space Leeds), 2011, installation of 39 flags: satin ribbon, linen, gratitude statements; dimensions site-variable; each flag 12 x 18 in / 30 x 45 cm. Photo: Katie Rutherford/Untitled Gallery, Manchester, UK. 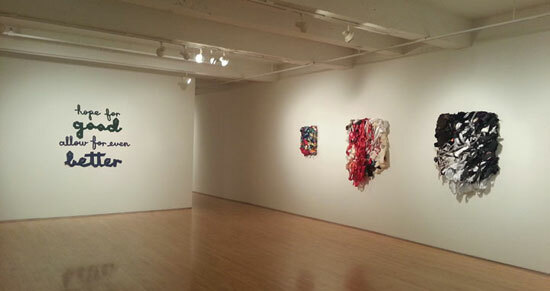 I’m very excited to exhibit two new text-and-ribbon installations, as well as a collection of Flag Snowflake collages. None of these projects have been shown in the US before.